Po’Boys are just awesome. Usually in New Orleans, we eat ’em in fried seafood form. There’s no such thing as a healthy po’boy. It just ain’t happenin’. Every Friday during Lent, it’s tradition for my family to buy some real New Orleans French bread and fill it with shrimp. Ever so often, I’d have a roast beef po’boy, but it just wasn’t the same as the fried seafood concoction I grew to love. Mix first 9 ingredients in a bowl until well combined. Form into 4 long, oval patties (to fit on french bread). Preheat skillet with oil on medium heat. Cook meatloaf patties appx. 5 minutes on each side. Add gravy to skillet. Reduce heat to low. Cover and cook for 5-10 more minutes or until meat is done in the center. 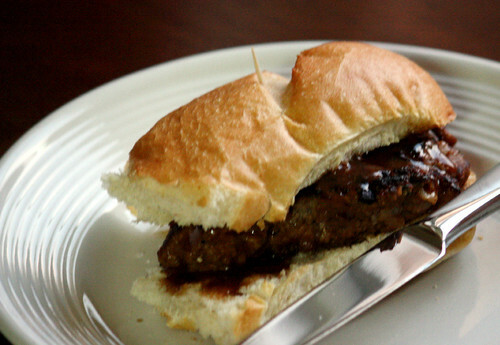 Serve patties with french bread, topped with gravy.